Tinker Bell as a toddler/baby. She has her arms raised and is holding her wand in her left hand in a downward position. Rosetta is posing in her pink autumn attire. She is standing in front of a light blue swirly background and has an orange butterfly and a yellow butterfly on her left, and a single orange butterfly on her right. This listing is for the Fawn pin from the open edition Disney Fairies Booster Pack (#90988). This pin features Fawn the Animal talent fairy from Pixie Hollow. Fawn is in a green square frame with leaves and an acorn next to her. This listing is for the Rosetta pin from the open edition Disney Fairies Booster Pack (#90988). This pin features Rosetta the Garden talent fairy from Pixie Hollow. Rosetta is in a red circle frame and has flowers around her. This listing is for the Iridessa pin from the open edition Disney Fairies Booster Pack (#90988). This pin features Iridessa the Light talent fairy from Pixie Hollow. Iridessa is in a yellow square frame and has sunflowers around her. Pins in this set: #90989-90994. This listing is for the Silvermist pin from the open edition Disney Fairies Booster Pack (#90988). This pin features Silvermist the Water talent fairy from Pixie Hollow. Silvermist is in a blue circle frame and has a waterlily next to her. This piece from the tangram set features a smiling Tinker Bell on a blue background. The piece is one of two small triangles. The pin is 1/2" tall and 1" wide. The back of the pin is stamped with the 2008 ODPT logo. This Open Edition pin features the lovely Tinker Bell just being herself. She is standing partially sideways, head turned to face forward, with her arms out at her sides, and her wings up behind her. Her wings are silver blue and she's wearing a green dress with green shoes. Her hair is pulled up in a bun. Features Peter Pan's Tinker Bell as a pin-on-pin in front of the Magic Kingdom's Cinderella's Castle. Says " Walt Disney World". A red banner on th ebottom of the pin says "Tinker Bell". This version is much smaller than the DLR version. Tinker Bell is standing on her right leg, on a plant of white flowers, and pointing with her right hand to a yellow flower bulb located on a tall green plant that is next to the flowers. A ladybug (red with black spots) is resting on one of the white flowers next to Tinker Bell. The background of the pin is blue. This listing is for the Peter Pan and Tinker Bell pin from the open edition "Disney Couples" Mystery Collection (#95855). Show off your patriotism with this Deluxe Pin Trading Starter Set! Walt Disney World 2012 Hidden Mickey Lanyard Series - Walt Disney World Star collection pin features Tinker Bell head in front of a purple and white eight point star. The star is in a circle with a yellow banner at the bottom that reads Walt Disney World. A silver Hidden Mickey icon is on the right side of the pin. This open stock rack pin is one of several core sparkle pins released at WDW. It features Tinker Bell from Peter Pan, against a blue sparkle background with stars, she is waving her wand and looking over her shoulder while kicking up one heel. She has a cute sassy expression on her face. The bottom of the pin reads Pixie Power. This is the corrected Tinker Bell pin with blue wing section (instead of green - see #805). Tink holds her gold wand in her right hand; she is leaning over/bending over at her waist with her left hand and arm stretched behind her. This pin is one of a series of pins released at both WDW and DLR for the premiere of the sequel to Peter Pan--Return to Neverland. The pin is of Tinker Bell sitting with her legs crossed, hands on her hips and her mouth opened. Tink's wings have glitter in them. This pin is Square with a pin-on-pin of Tinker Bell. It features the United way logo of the hand and a person standing on the hand. Just Below the hand it says United Way participant and then below that 2003. The background of the pin is black with silver lettering. The pin has a full color Tinker Bell bending over to the left with her wand almost touching the person standing in the hand. Available only at Disneyland Resort. To get this pin, you had to have been a a Disney Club member who booked through Disney Travel; when you did, you got a voucher which then had to be turned in at Disneyland. Flora Nesting doll from set Pin 101877 Nesting Dolls Mini Pin Pack. This pin features Flora in her pink dress. Fauna Nesting doll from set Pin 101877 Nesting Dolls Mini Pin Pack. This pin features Fauna in her green dress. A donut shaped pin decorated as Tinker Bell with green at the bottom and yellow for her hair at the top complete with a blue ribbon. Square, brass pin from Disney's California Adventure Animation attraction. Features Tinker Bell, from Peter Pan laughing sketch. Animation logo on bottom left corner. Pin measures 1 & 1/4 inches by 1 & 1/4 inches in size. This open stock rack pin released during the Search For Imagination Pin Event at Epcot, is one of a series of Name Drop pins with 4 FAB Characters and a friend helping to display the Walt Disney World logo. This one features Tinker Bell kneeling above the logo. This listing is for Tinker Bell pin ONLY from the Disney Tsum Tsum Pin Collection #108000. This listing is for the Tinker Bell pin ONLY from the 2015 Dated Booster Set (#107568). Tinker Bell upper torso and head shot. She appears in front of a turquoise flower. Her left hand is touching her hair (bun). Premiered at the WDW Pin Celebration, "A Journey Through Time," hosted by Epcot September 19-21, 2003. The pin measures 1 5/8" (4.1 cm) wide by 1 3/8" (3.5 cm) tall. #59 of this series It features Tinker Bell on a purple background. "Do you Believe in Magic" is written in white. Open stock 3D pin features Tinker Bell on a green sparkle background with Sleeping Beauty's castle. Reads " DL the original". Banner says "Disneyland". Round pin featuring Tinker Bell's face. Pin is made of silver colored metal with green enamel. This listing is for Tinker Bell only from the 2017 dated character booster set. This 6 pin set features character faces next to 2017 written out with a yellow 2, blue 0, green 1, and red 6. Each pin has the character on the left with a blue star and two silver stars on the right. The pin reads “Find Your Happily Ever After." At the bottom of the pin is the Magic Kingdom logo. The background has the images of a storybook, Tinkerbell, and a part of Cinderella's Caste surrounded by glittery black sparkles. It is an open edition pin and has been available to the public at Walt Disney World® Resort since late August 2017. Tinker Bell is posing next to a blue and silver party hat with red and white streamers on the top. Her wand is pointed down at a blue banner that reads 'Happy New Year. This is the Tinker Bell handbag from the mystery handbag collection. There are 16 pins in total for this collection. They come in a bag. It is a little over 1" in height. The pin is green with gold stars on the bottom. It has blue wings with Tinker Bell's white pom poms from her shoes hanging from the center. One of a collection of 16 pins in a mystery bag of 5 featuring various characters as ice cream bars or popsicles. Tink has a pale green bottom and a yellow top. The pin depicts the back of her head with a ribbon tied around her bun, light blue wings through the yellow top. A bite has been taken out of the ice cream bar at the top right. It is white with a small white melting of ice cream down the side. The stick is silver with ridges. This listing is for the all silver CHASER version of pin #97207. Walt Disney World 2013 Hidden Mickey Cast Lanyard Series - Park Icons with Disney Characters collection pin features Tinker Bell inside the silhouette of Magic Kingdom's Cinderella Castle. There is a silver Hidden Mickey icon on the right side of the pin. This pin is part of the 2013 Walt Disney World Resort Hidden Mickey Series. This open edition 3D pin released at DLR is part of a 3 pin series. It celebrates the 2006 year. The background of the pin is blue with sparkles and has 2006 in red across the middle, Sleeping Beauty's pink castle is on top. The bottom of the pin reads Disneyland Resort. This pin depicts Tinker Bell, flying in front of an, intricately designed, Cinderella's castle. At the base, of the castle, are four green lawns with trees. The castle is gray, with blue rooves and blue and gold spires. Behind the castle is a, dark blue, spinning disk with red, white and blue fireworks, yellow starbursts and gold stars. Captured in one of her more sullen moods, Tinker Bell strikes a demure pose with downcast wings on this black-metal character pin, a Disney Auctions exclusive in a limited edition of 5,000 gift-with-purchase pins. This open stock rack pin released from Walt Disney World Resorts is one of a series of Soda Pop bottle top (cap) pins. This one features Tinker Bell from Peter Pan in the middle of a pink bottle top. The pin reads Pixie Pop. Fresh! Bubbly! 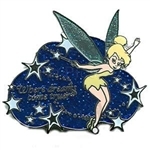 This listing is for the Tinker Bell pin from Disney's Magical Mystery Pins Series 9 see # 113716. This pin features a bottle cap shaped design with Tinker Bell from Peter Pan. The background is pink and features silver dots and hearts. To commemorate the 50th Anniversary of Disney's Peter Pan which was released February 3rd, 1953, Disney is releasing a Tinker Bell pin in a new series: 50 YEARS OF TINKER BELL. All pins from the series will be released on the 15th of the month. This is the first in series of 12 pins, all of which have the '50 Years of Tinker Bell' logo. This roughly square pin has an outline relief of Tink on the left side, and text on the right: "Tinker Bell... Peter's pixie friend! Her jealous nature almost brings disaster upon Peter and his friends!" The back of this pin reads "Tinker Bell Character Description First in Series of 12" Pins in this series include: #18507, #19334, #20230, #21247, #21456, #22267, #23336, #24138, #24349, #24963, #25601, #26057. Fantasy Tinker Bell No Fly Zone pin. Pin is 1.5" round. Dated March 2003 with the words No Fly Zone March 2003 Grounded Until Further Notice going around the pin. In the center of the pin it says What's a Pixie to Do? Going along the lines of the current affairs in our country during March and April 2003. Backstamped: LIMITED EDITION 300 CHINA. inker Bell stands in front of a purple glitter Mickey icon, facing left with her right arm out. There are "amethyst" and "diamond" jewels on the right side of the pin. "Grand Opening" is written across the center of the pin in gold/yellow; next to this lettering is a gold glitter castle representing the Resort's Enchanted Storybook Castle. Near the bottom of the pin is written "Shanghai Disney Resort" and the name of the resort in Chinese characters. Size: 1 3/4" wide x 1 5/8" high. This is the completer pin for the second day of EPCOT's Search for Imagination Pin Event. This pin is of Tinker Bell resting on her elbows and holding her face in her hands. Her elbows are on top of the Event Logo - Disney's PiN CeLeBraTiON the search for iMAGiNATiON 2002. This is the completer pin for the 2018 Hidden Mickey Frozen Treats collection. It is the a Tinker Bell themed soft serve ice cream. The cup is green with sparkling stars. The ice cream is yellow with a blue ribbon tied into a bow around it. There is a small silver hidden Mickey in the middle left. The back of the pin is a Mickey waffle pattern with a single post and no nubs. This is completer pin. The pins in this series are #130625-#130630. This open edition pin features Tinker Bell in front of Cinderella Castle at Magic Kingdom Park. Tinker Bell is a pin-on-pin, and a banner with the words "Magic Kingdom®" is underneath the castle. This pin was given to cast members who worked on Christmas day during the 50th anniversary celebration year. It has Tinker Bell on the right hand side and a blue background. It says "Happy Holidays 2005" with a snow Mickey Mouse icon that has "50" in the center and "Disneyland Resort" on the bottom. This gold-finished, textured-back pin measures 1 7/16" tall by 1 1/2" wide. Tinker Bell comes out of the 0 in 2019. This cast exclusive spinner features Tink standing next to a clock counting down to the new year 2010! The pin is a clock covered in confetti and sparkles. Numbers 12, 1, and 2 are in a red sparkle section of the clock Numbers 3, 4, and 5 are in a yellow sparkle section of the clock (The big hand on the clock witch is a green sparkle is behind the 5) Numbers 6, 7 and 8 are in a blue Section of the clock. (The little hand of the clock is between the 7 and 8 it is a red sparkle hand) Numbers 9, 10, and 11 are in. Pink sparkle of the clock. There are three balloons on the pin closest to numbers 9-11 the tallest balloon is a red with a pink and blue sparkle confetti The next balloon is Blue with a yellow and red sparkle confetti on it The last balloon is green with a pink sparkle confetti on it Tink her self is about 2 inches tall she has her classic dress and large sparkle blue wings, she has a striped hat and is blowing on a noise maker. She is facing to the right of the pin. The pin is about 2 inches by 2 inches(From the farthest point to point), its a lovely sparkle spinner that on one side reads "New Years eve 2009" and on the other side reads "Happy New Year 2010!" This round pin has a picture of Tinker Bell on a purple background in the middle. Around the outside it says "Fantasy in the Sky Fireworks" and Walt Disney World. It also bears the 20th Anniversary logo in gold. Tinker Bell in a swirl of Pixie Dust and Thanksgiving treats are celebrating Thanksgiving. This Limited Edition pin has a turkey leg dangle hanging down from an orange ribbon with Thanksgiving 2005 written on it. Tinker Bell is ready to celebrate the first day of fall 2005 in this Limited Edition pin. She is carrying a brown leaf while walking in front of three pumpkins. Tinker Bell is a pin-on-pin. The background is a gold circle with autumn leaves flying across it. The pin reads "1st Day of Fall" in gold letters on brown, and the bottom says "Disneyland® Resort 2005" in gold letters on black. This bell shaped LE 750 pin features Tinker Bell celebrating the holidays at Disney's Contemporary Resort. This pin has Tink flying past the monorail as it comes out of the hotel. The ringer is pink glittered and moves back and forth. This gold-finished, textured-back pin measures 1 7/8" tall by 1 1/2" wide. To commemorate the 50th Anniversary of Disney's Peter Pan which was released February 3rd, 1953, Disney is releasing a Tinker Bell pin in a new series: 50 YEARS OF TINKER BELL. All pins from the series will be released on the 15th of the month. This pin depicts an early artist color rendering of Tinker Bell sitting on a block of letters. Pins in this series include: #18507, #19334, #20230, #21247, #21456, #22267, #23336, #24138, #24349, #24963, #25601, #26057. Tinker Bell - Disney Movie Club VIP Pin #70 Tink on her toes, leaning over from the waist is facing right. Her wings are glitter filled. Her wand in her left hand is raised to impart fairy Dust on a deserving soul. This pin set features the adorable baby Tinker Bell in an array of 7 different pins. Commemorate 35 Magical Years of the Walt Disney World® Resort with this special Limited Edition pin collection titled "35 Magical Milestones." This 36-pin collection celebrates moments, experiences or attractions from each of the 35 years of the Florida destination. Each pin will have an edition size of 2500, and five new pins will be released each week starting August 13, 2006 in anticipation of this magical anniversary. Tinker Bell took flight over Cinderella Castle for the first time on July 3, 1985. Tinker Bell is featured in ths Limited Edition pin flying over Cinderella Castly. Tink is a pin-on-pin and the Magic Kingdom® Park banner is a dangle. The artwork for this pin was designed by Disney Design Group artist Alex Maher. This pin features Tinker Bell from the art work "Magic Carpet Ride" It's part of a 20 pin set that was released during the Afternoon of Enchantment Event in Orlando. The pins shows Tinkerbell, the fairy from the movie Peter Pan. her wings are sparkling silver. She is bent at the waist facing left. The pins came in Blind Bags. The Fairy Godmother from Cinderella using her magic wand to light the star at the top of a Christmas tree. This was given out if you purchased a toy from DSSH for the Toys for Tots program. This limited edition pin of the month series features the poster designs from Disneyland® Resort attractions. This pin includes the poster of Disneyland® Resort attraction, Matterhorn Bobsleds, and opens to reveal the Tinker Bell being chased by the Abominable Snowman. This pin released at Disneyland USA in July 2000 is from a set commemorating the Parade of Stars. This one is of the Blue Fairy float. It's hard to read it in the scanned picture, but the card is stamped in gold ink "Parade Limited Edition". This pin is very similar to #3052 which has a gold border and was given to guest participants in the parade. This retro inspired pin of the month collection commemorates the 40th anniversary of Walt Disney World®. Each month in 2011, a different classic attraction will be highlighted along with a pin-on-pin Disney character. This pin features Tinker Bell with the Walt Disney World® Monorail System. Tinker Bell is a pin-on-pin element. The pin features a red and blue Monorail coming out of the Contemporary Resort in front of a pink/salmon background. The pin reads "Walt Disney World Monorail System". There is "40 years" in the retro D logo in the lower left corner. Backstamp states this pin is "1 of 12"
Pinocchio is transforming into a donkey. On the other side is Pinocchio with The Blue Fairy who brings Pinocchio to life. This pin opposites the good luck and the bad luck of Pinocchio. This is Version 2 of the Tinkerbell pin from the June 2018 Disney Store Online Park Pack. This pin features Tinkerbell from Peter Pan peaking from behind a leaf. The leaf is pin-on-pin and stained glass so you can see Tink behind it. The color of the leaf varies between the versions of the pin and in this one it’s red. There are 3 variations to this pin, each a limited edition 500. The back of the pin has the Mickey icon pattern. In the center top is a box with the 2018 ODPT logo. Below that is a box that says Pin 2 of 3 and Limited Edition 500. The box below that says ©DISNEY and Made in China. And the bottom box has the FAC. The Pin has two posts and no nubs. There are also two rivets for the pin-on-pin. Guests that purchase the "Pin Trader's Sundae" formally known as the Pin Trader Delight ice cream sundae will receive this Limited Edition pin. This continuation of the Type Cast series features Flora, Fauna and Merryweather of the film Sleeping Beauty. The pins are the size of a dime, and are meant to look like type writer keys. The pins have a white background with black and silver lined silhouette portraits.